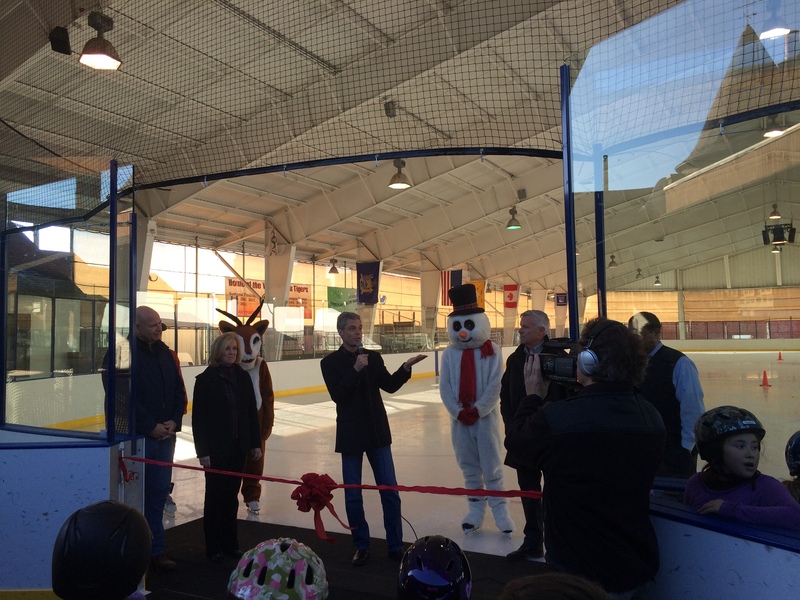 Home→Mayor Dedicates New, Improved “Happy Rink.” Registration for January Classes Begins. 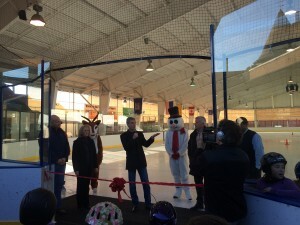 Mayor Dedicates New, Improved “Happy Rink.” Registration for January Classes Begins. Mayor Thomas Roach, Recreation and Parks Commissioner Wayne Bass, Rudolph the Red Nosed Reindeer, Frosty the Snow Man and White Plains Skating Enthusiasts particpated in a ceremonial ribbon cutting last week officially recognizing the refurbishing of “The Happy Rink,” Ebersole Ice Rink in Delfino Park by the Roach Administration. The rink was refurbished with new compressors, new sideboards and new glass side panels, and new indoor flooring, new lighting and new paint. The compressors have already stood up to the amazingly warm temperatures since it opened in October — maintaining a skatable surface in the face of temperatures in the 50s and 60s. In previous years before the new compressors were installed ontime this past summer for an October opening, ice puddled and softened. Not this year. The ice-house is now brightly lit, and has seamless rubber flooring, a huge improvement. The new rink is invigorating to skate on, providing one of two outdoor rinks in Westchester, with a friendly,wholesome atmosphere and sense of community. It’s also time to sign up for new age and skill-appropritate ice skating classes Fridays Saturdays and Sundays beginning January 15, 2015. Sign up at White Plains Recreation and Parks Headquarters at 85 Gedney Way or at the rink, or drop by the rink at any public session. You may contact Skate School Director, Jennifer Netrosio at 914-282-9426 or jennifernetrosio@gmail.com. Ms. Netrosio is an Ebersole success story. She learned to skate at Ebersole and is dedicated to preserving and fostering the special skating experience “The Happy Rink” is known for. Parents can sign their future Kristi Yamaguchis and Scott Hamiltons for Tots I (ages 4 to 6), Tots 2 (4 to 6), Pre-Alpha (Ages 7 and up), Special Alpha ( Ages 6 and below), Alpha ( 7 and up), and advanced classes: Beta, Gamma/Delta Freestyle 1/2, Freestyle 3 and Adults (it is possible to learn the intricacies of skating into your 70s and enjoy the recreational fitness advantage! The Skate School also has a Hockey Learn to Play program for 7 weeks. Pick up a brochure at the skating rink or the Rec and Parks for fees. Next week between Christmas and New Years, Ebersole will run a special Publick Skating schedule :Monday, Tuesday, Wednesday, Thursday, the 28th through the 31st–1 to 5 PM. New Year’s Day, Friday, 3 PM to 7. Sunday, January 3 — 8:30 to 10:15–Adults Only; 1:15 to 5:15 General Session.